Hello friends, hope you are keeping warm and happy. I have been busy setting up the new March pages for my bullet journal. 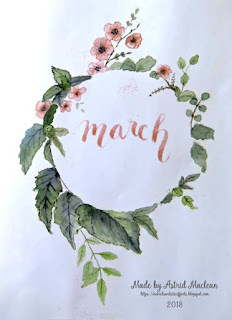 Setting up a new month always takes quite a bit of time, and this month I decided to take a few shortcuts: I spent a happy afternoon painting a leaf wreath with watercolous only. I then scanned that page and use it to decorate all of my March pages. 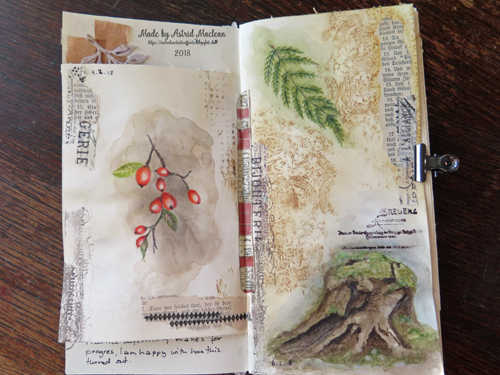 I did it for two reasons, - to save time, but also because I have found it more and more frustrationg that any watercolour or pen work directly in the journal, bleeds through the thin pages of my Leuchtturm journal. 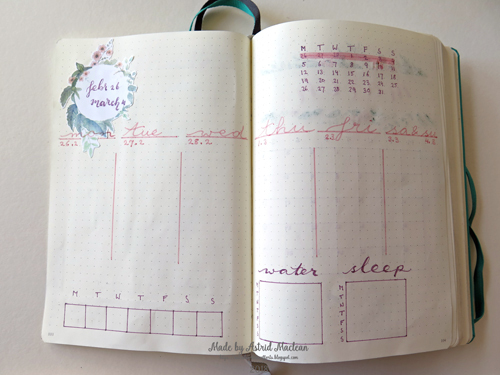 This is a well know phenomenon and the bulletjournal communty calls it ghosting. I did a few original drawings still, but mostly just used my scans. Here you can see the original scanned painting, which I resized and used on the various following pages. 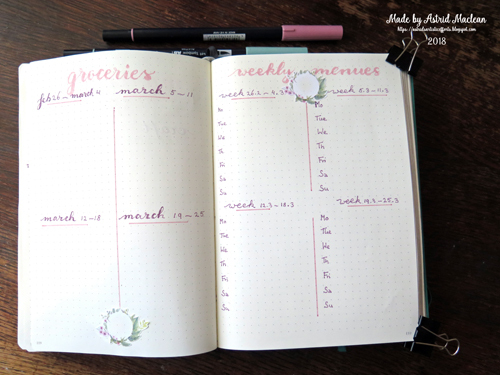 My weekly spread for the for this week, transitioning from February into March. 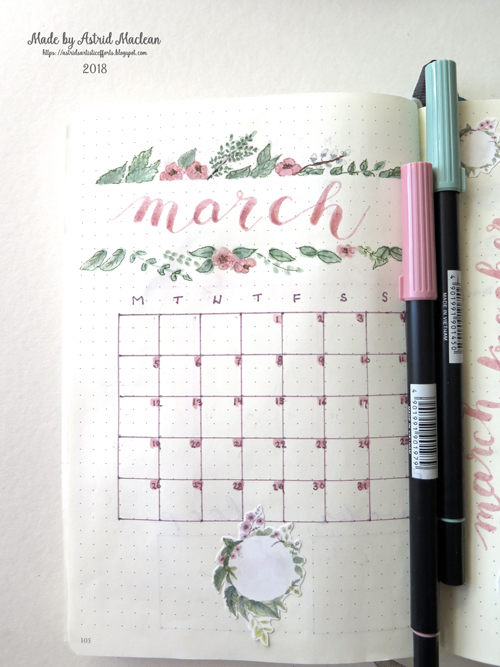 My monthly spread. 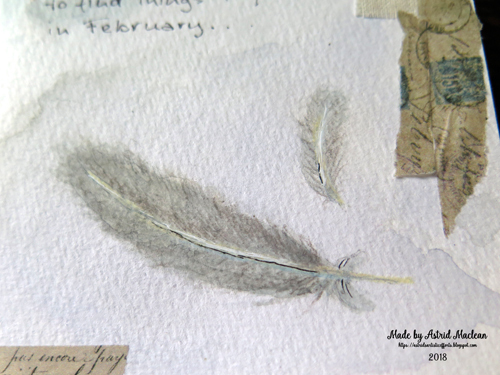 The top here is the only other original drawing I did, I tried to match the clours but used pencils rather than watercolours. (They still ghosted through somewhat). 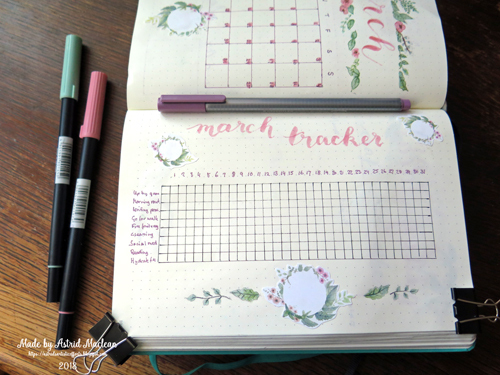 Monthly habit tracker with a bit of doodling to the side of the wreath. 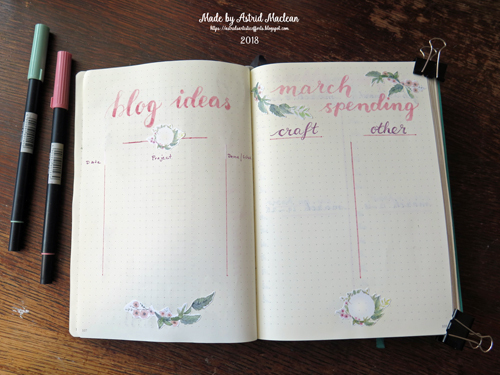 And finally keeping track of my house hold spending and tasks. 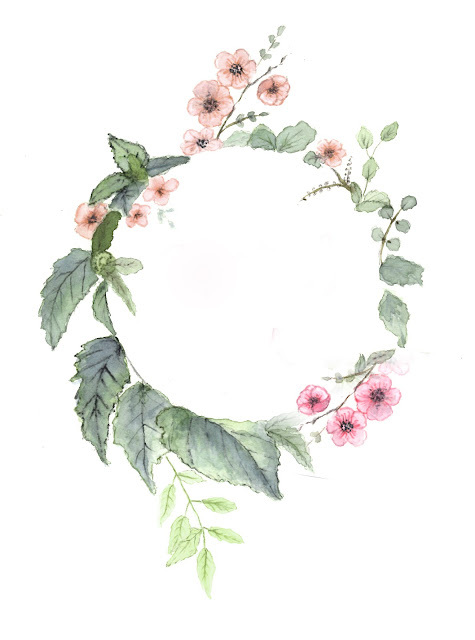 If any of you are into planners or journals like these, you are welcome to download this little wreath as a freebie. 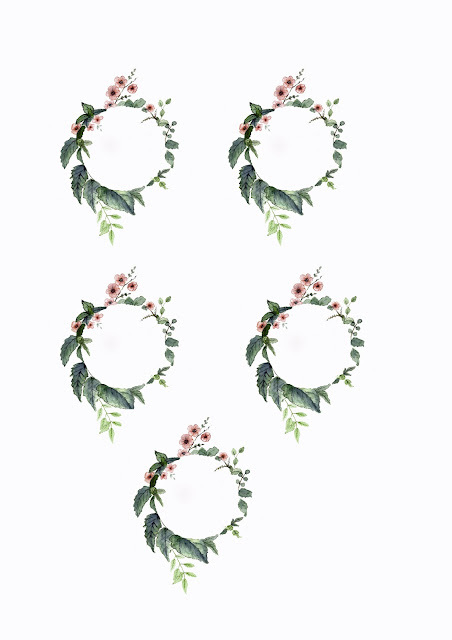 I'll add it in three different versions below. You can resize them to your own needs of course in any photediting programme. Well, that's it for now and like always thank you so much for taking the time to visit, I really appreciate it. 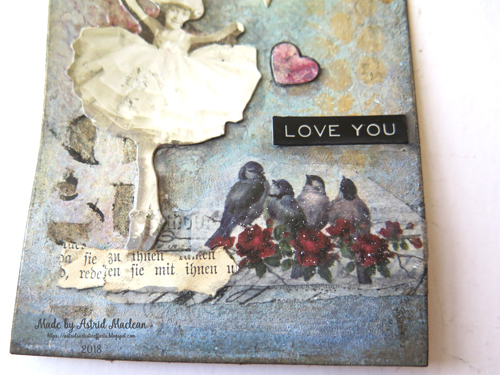 This latest class was taught by Kathy Glynn and was called words of gratitude. 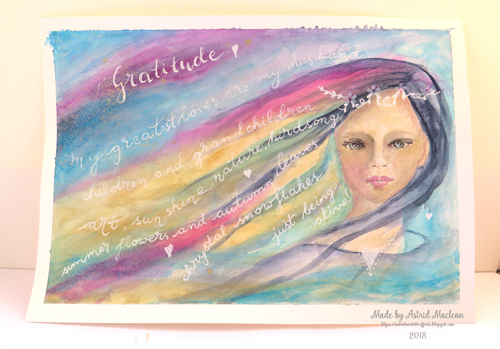 Like usual with Lifebook projects I cannot tell you exactly how I went about it, but it was basically a watercolour portrait with flowing hair into which you added words of things you are grateful for.. 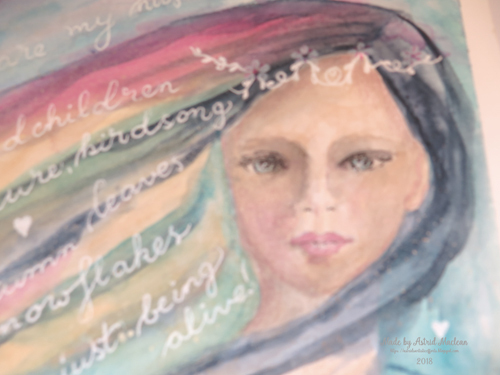 I pretty much did my own thing, both in terms of colours and in the way I added the words and did the actual face part of the painting. It's a long time since I have done a portrait all in water colour, all I can say is, - it was useful practice, even though I really don't like the finished result, but this is all a journey, so live and learn and better luck next time. 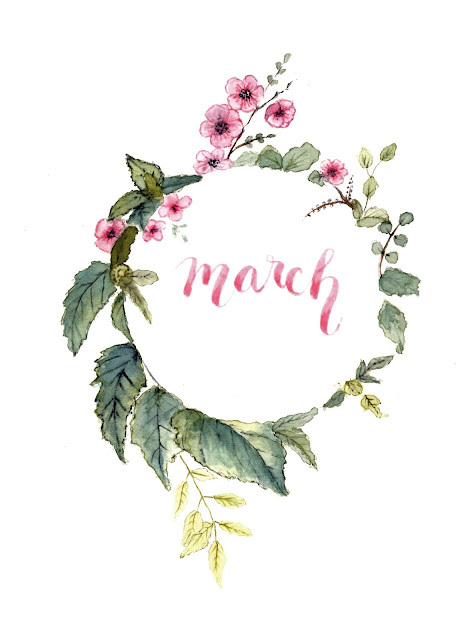 Well that's it, hope you all get some creative time and that the weather is kind to you, - here more winter weather is forcast, and I am sooooo ready for Spring. Hello friends, hope your day is going well. 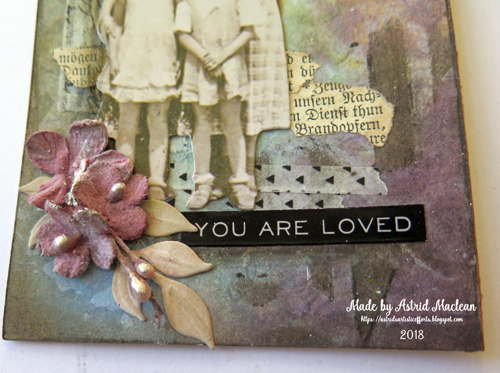 Like many of us I am sure, I succumbed and ordered some of the new Tim Holtz Distress Oxide inks recently released at Creativation, and this was my first chance to have a play with them. I made two projects, playing with some of the different colours and using glossy photocard that I had lying around. As you can see this is a little book I will keep by my bedsite to note down some of my dreams. I am facinated by dreams and decided I would record them for a while. Anyway, onto the project. I played around with various colours, old and new. 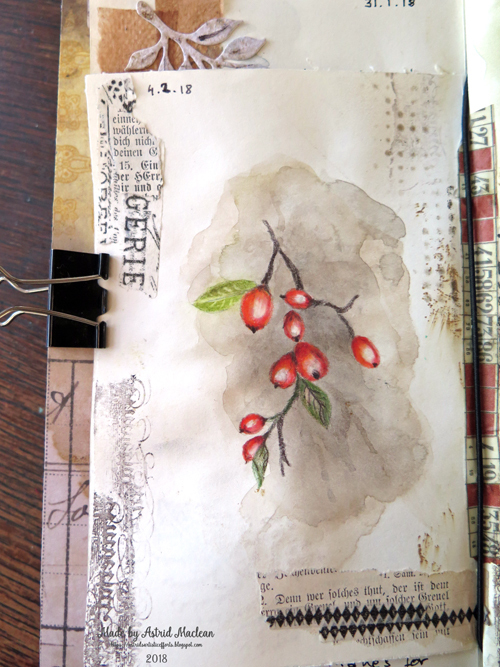 For this background I used Broken China, Antique Linen, Gathered Twigs and a tiny bit of Aged Mahogany. 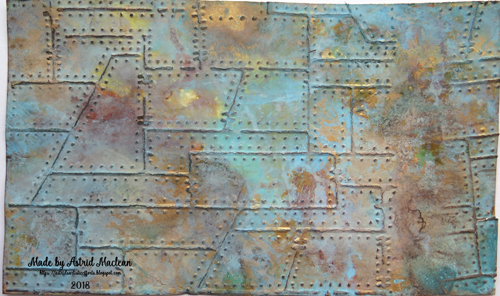 I also used tiny bits of gold acrylic paints. 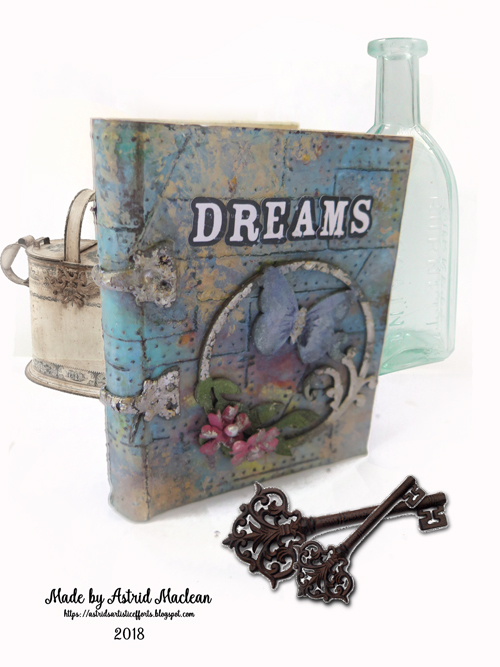 I embossed it with a very old Tim Holtz embossing folder and then went over the raised bits with normal Distress ink in Ground Espresso. I then spritzt with some water and finally rubbed over it all with Distress Micro Glaze, trying to follow a technique Tim demonstrated during a video from Creativation that I watched. 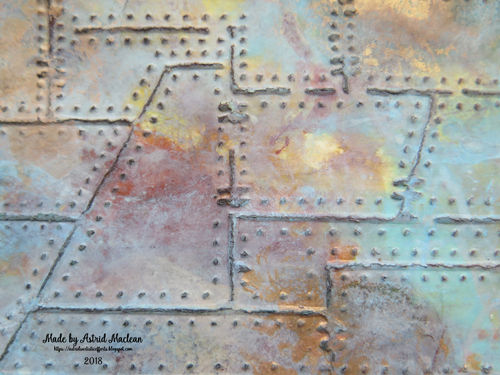 Going over it with the glaze is meant to bring back some of the oxidised colour. Tim used Alcohol Ink card, which I don't have, so that's why I used the glossy photocard, but to be honest, it did not work very well. Anyhow, I decided to use the card for the cover of this little book. 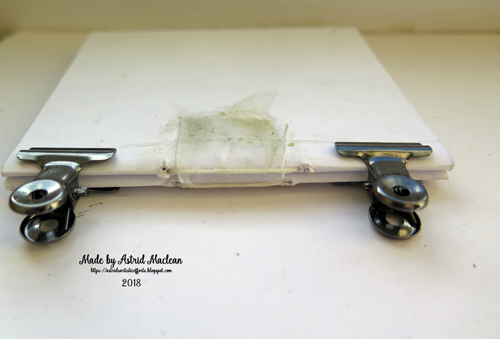 It has two signatures and following a tutorial I found on youtube I adhered them together using some ribbon before adhering the endpages to the cover. 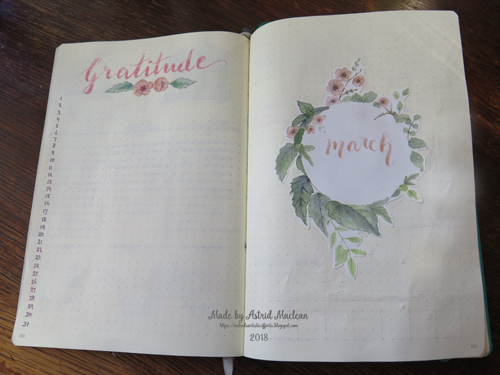 I then covered the insides of the cover with some bits of design paper and some washi for extra strength, as the paper of the signatures that I used is quite thick, almost like thin card. I decorated the spine with two hinges from an ancient stash of grunge card stock I still had lying around from years back. 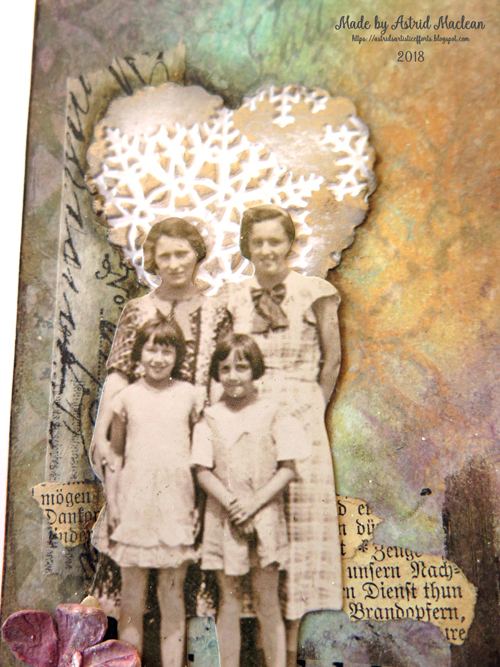 I embossed them with Ancient Silver EP to give them a metal look. 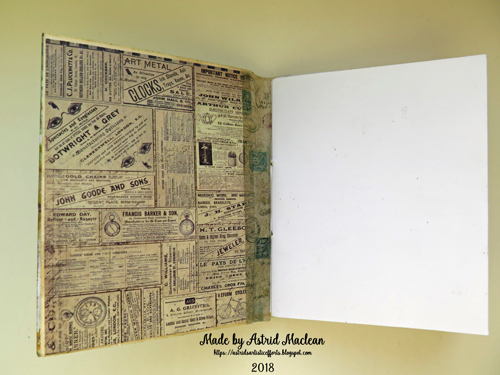 The front was decorated with a Gypsysoul lazer cut chipboard piece, also partly embossed with the ancient silver ep. 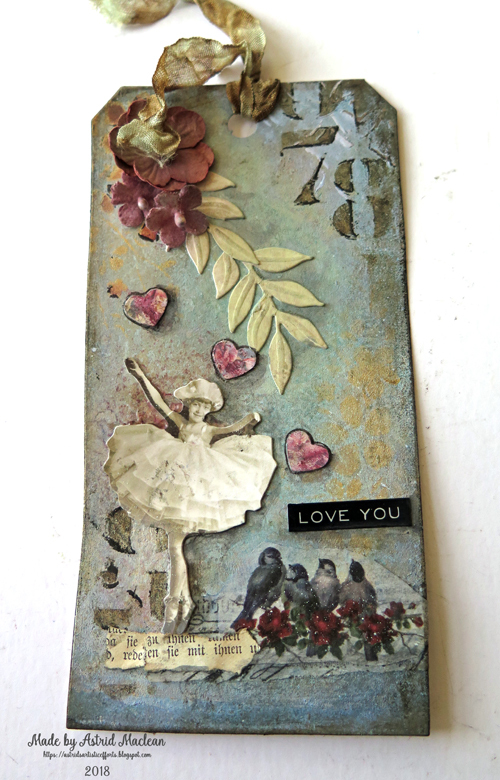 I also made a quick card still, with slightly different colours. A word band, the letters highlighted with Distress Crayon. 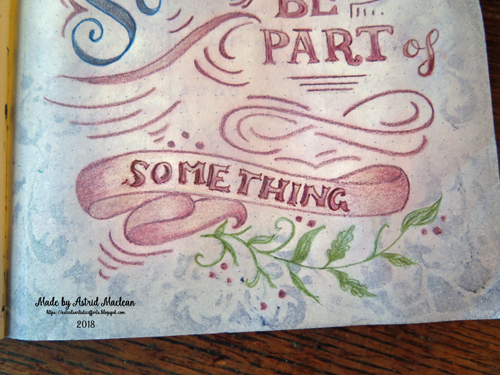 The embossing here was also done with the help of a Distress Crayon. Well, that's it for now. Hope you get some crafting playtime, and thanks for your visit like always! Number 9 Again, counting down, that is Candy C.
I found this quote and lettering style on Pinterest and copied it, just in different colours. 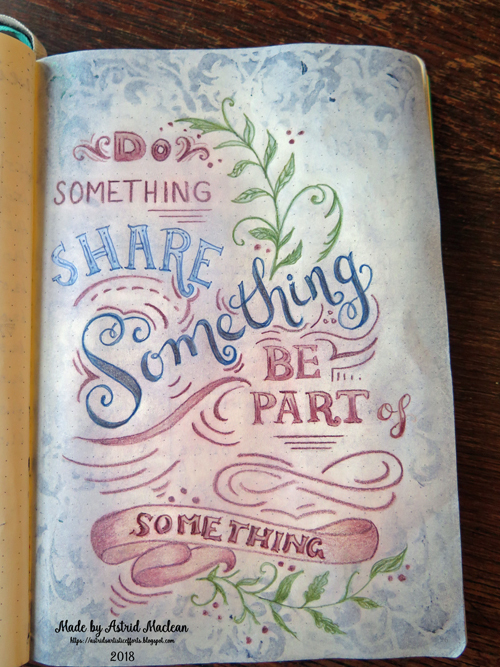 I used my Prisma Premier softcore pencils for the letters and Gelatos for the background. Wished I'd kept the background simpler as the whole page has become too busy, but like usual, live and learn, that's what this whole journey is about isn't it? Anyway, hope you are having a good week, and like always, thanks for your visit! 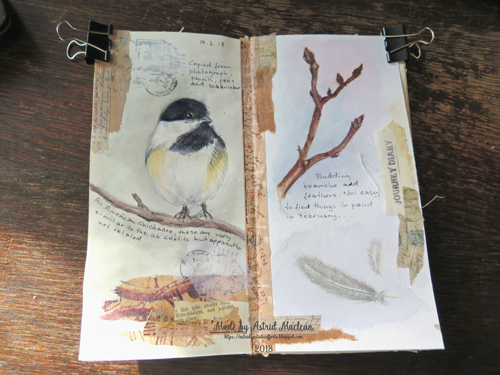 Hello lovely visitors, today I am sharing another spread in my nature journal, you have all been so kind and encoraging about it, so thanks for that!! 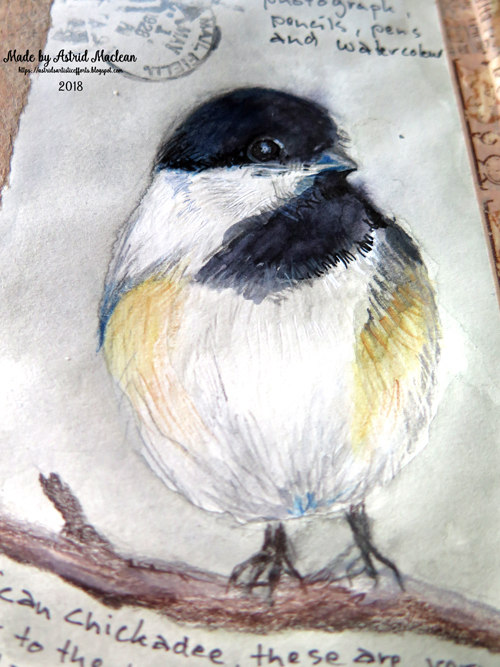 This little chickadee was mostly copied from a photo on the wonderful Pamelia's blog, but I also looked at other photographs. Here in the UK we don't have chickadees, but our native coletits are very, very similar, though apparently not related... 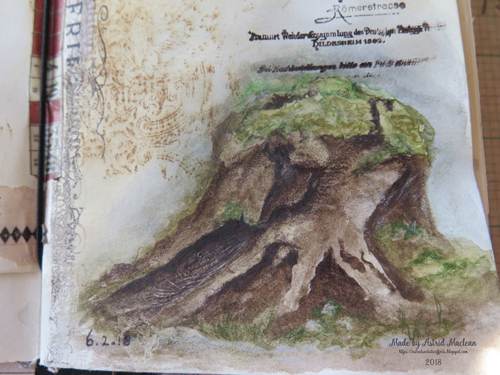 I used watercolour pencils, Prisma Premier pencils, watercolours and even a black Tombow marker. 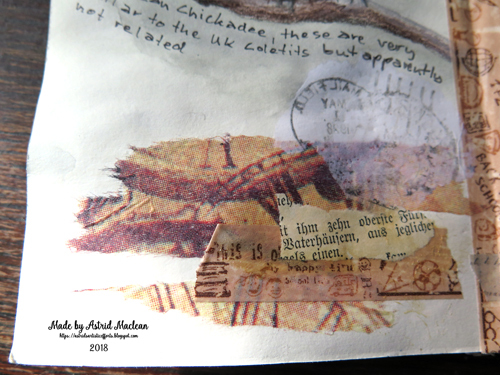 Like usual, I also added strips of washi, old book paper and here also a few scraps of rice paper and a little stamping on tissue.. 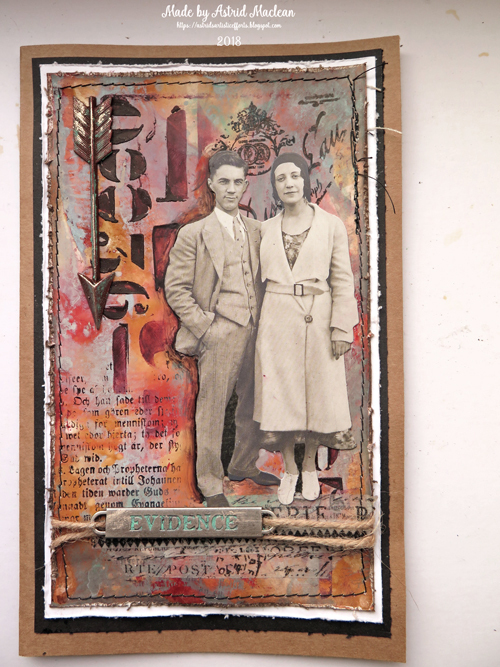 I love playing with little bits of collage around my hand painted elements to complete the pages. 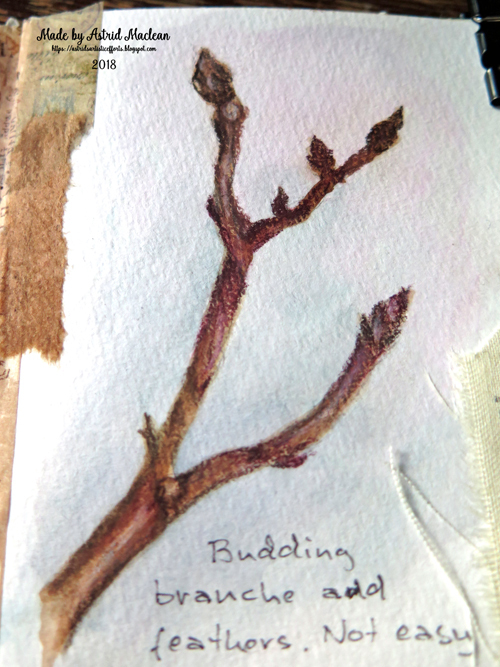 This branche is based on the budding branches of a big chestnut tree I can see out of the window of my artspace (studio would be too big a word for it lol). 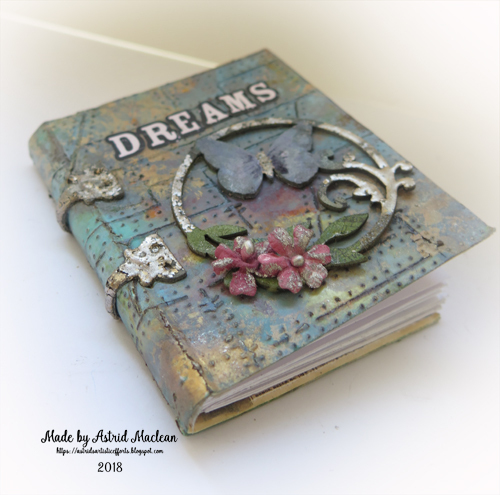 The cover for this journal, as some of you may remember, was made with the Eileen Hull journaling die. 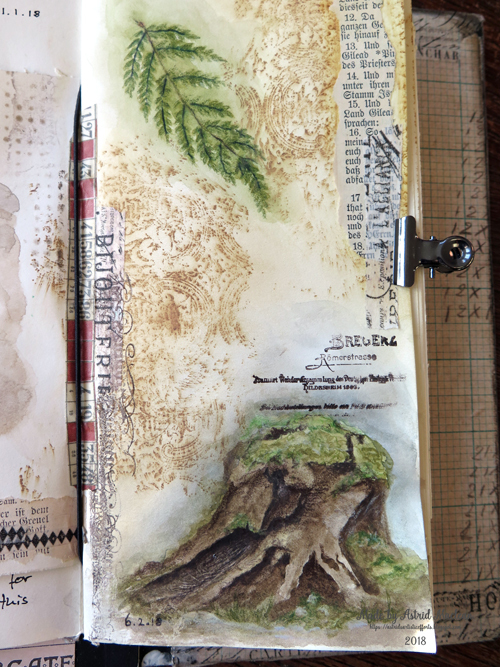 I love that with the help of the elastic, I can take the actual journal in and out of the cover, which makes it much easier to paint. Here you can see it inside the cover. Well, that's it for today. Have a lovely weekend and thanks for your visit like always! Hello everyone and happy Valentine's Day to you all! My post today is dedicated to you my lovely visitors and followers to wish you a day filled with love and happiness! 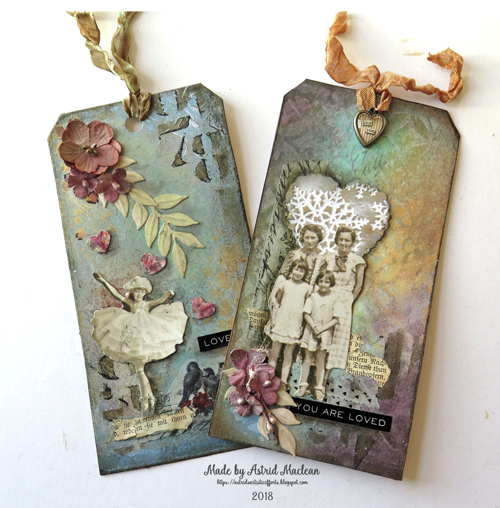 After all my posts with hand painted and drawn things, I wanted to create something using mostly inks and stamps once again, so I made these two tags to say thank you to you all, for following and visiting. At the time of writing this, more than two and a half thousand of you are following me and every day I am surprised and humbled that you have decided to follow me on my art and craft journey here, so THANK YOU and know that you are truly loved and appreciated!! 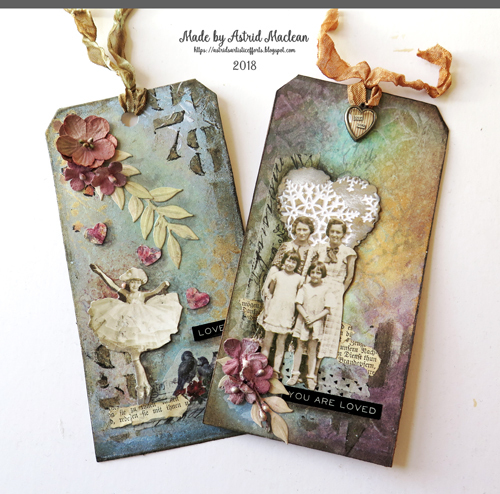 The background to these tags was created using gelli prints with Paperartsy Fresco paints and various stencils, and a few background stamps. 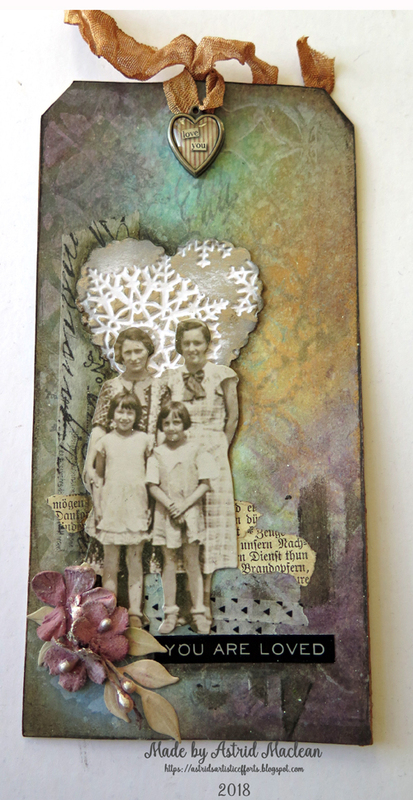 I then added some Oxide and normal Distress Inks, further stenciling and embellished with some flowers, little diecuts, some strips of washi and old bookpaper and a little Tim Holtz paperdoll. The little girl symbolizes for me the joy of life and creating. 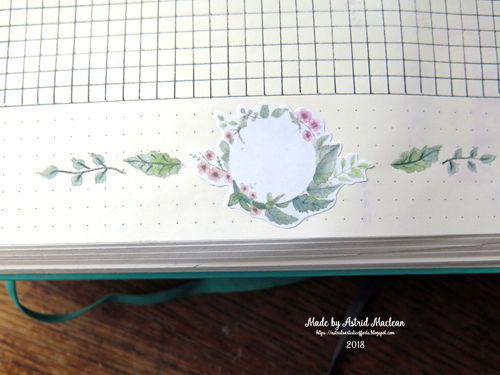 The second tag was done in a similar way, just with a different layout. This little group represents for me all my wonderful blogfriends that I have had the joy to connect with over the years. 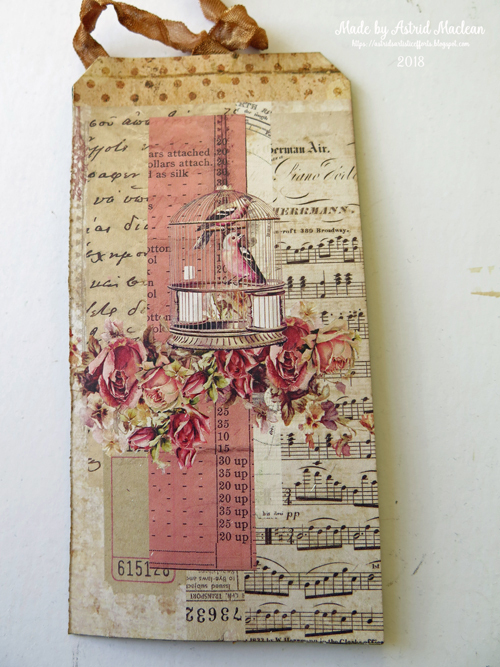 Like on the previous tag I used strips of washi, book paper and a few flowers etc to embellish. 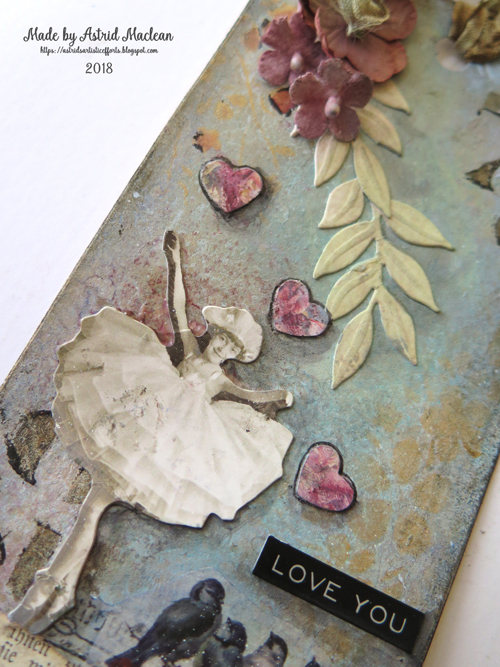 The back of the tags is finished with some pretty design paper from the Prima Love Clippings collection. Now I thought if some of you would be interested to receive one of these tags in the post, just let me know in a comment below and I will send it to you. If there are more of you I will simply pull a name out of the proverbial hat. So once again, thank you so much for being here and following my creative journey, I appreciate you all more than I can say!!! Hello friends, hope life is treating you well. 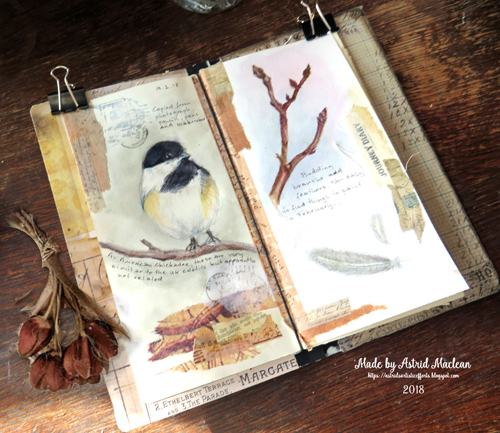 Today I am sharing another page from my nature journal and also want to thank you for all your encoraging comments on the previous page I shared. Inevitably I suppose, some pages work better than others, and I am not too happy with this one, but thought I would share it anyway. 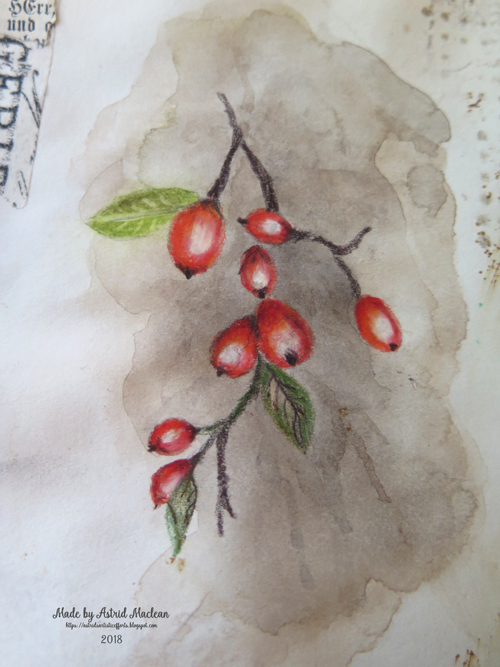 These berries I painted from a photograph I took on my phone the other day on a walk, I don't know what they are, not rosehips, even though perhaps they look like that. It was quite rainy and I wanted to capture the wet on them, which gave them a lovely shine. 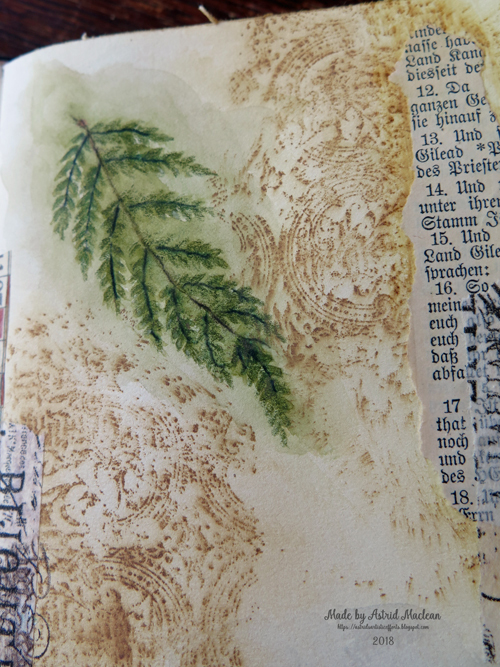 The next page is meant to be a mossy tree trunk and a fern leaf. The trunk is again from a photograph I took on another walk. 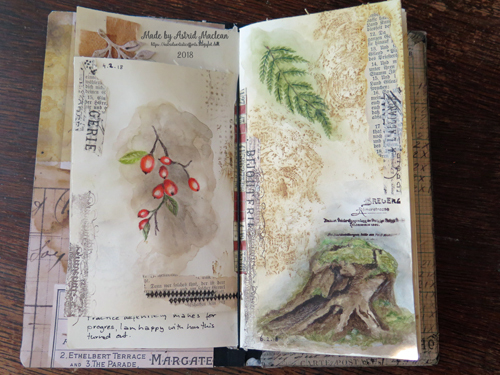 I failed hopelessly on the moss I'm afraid to say, but it's all about the practice I suppose, that's why I started this journal in the first place. 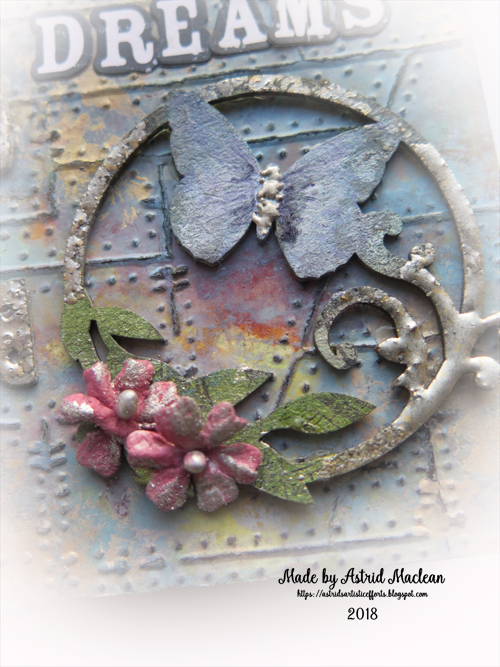 For the background on this page I used a cool technique I saw the other day on youtube in a video by Scrapcosy (a designer for Paperartsy). 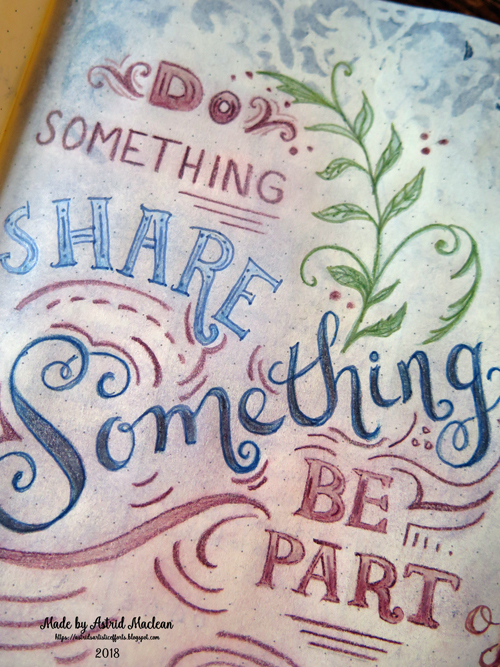 You take a stamp and stamp it in Oxide ink, then take a blendingsponge over it. 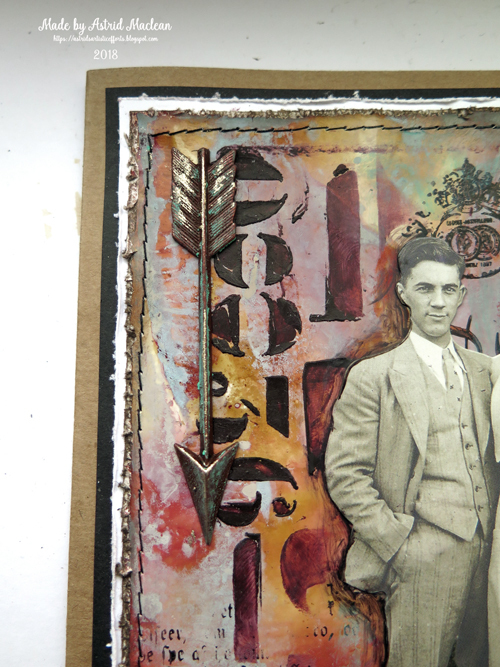 Because Oxides are a mix of die and pigment ink (which takes much longer to dry) the die ink keeps the image in place while the pigment ink smudges. I love this technique. 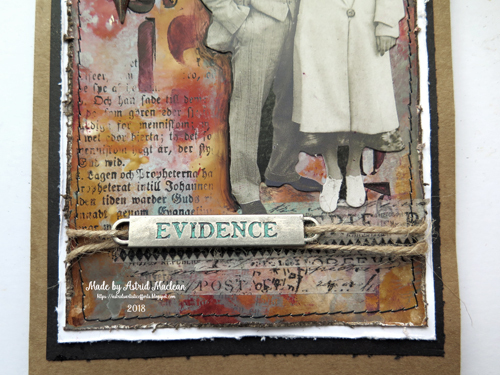 The stamp I used is a background stamp by Andy Skinner. Well that's it for today, like always thank you for your visits, which are very much appreciated!